Arminius, Jacob (1853). Nichols, James; Bagnall, W. R.. eds. The Works of James Arminius, D. D., Formerly Professor of Divinity in the University of Leyden, Volume I. Buffalo, NY: Derby, Miller, and Orton. Arminius, Jacob (1853). Nichols, James; Bagnall, W. R.. eds. The Works of James Arminius, D. D., Formerly Professor of Divinity in the University of Leyden, Volume II. Buffalo, NY: Derby, Miller, and Orton. Arminius, Jacob (1853). Nichols, James; Bagnall, W. R.. eds. The Works of James Arminius, D. D., Formerly Professor of Divinity in the University of Leyden, Volume III. Buffalo, NY: Derby, Miller, and Orton. Bangs, Carl (1985). Arminius: A Study in the Dutch Reformation. Grand Rapids: Asbury Press. ISBN 0310294819. Israel, Jonathan (1995). The Dutch Republic: Its Rise, Greatness and Fall, 1477-1806. Oxford: Oxford University Press. ISBN 0198730721. Leeuwen, Theodoor Marius van (2009). 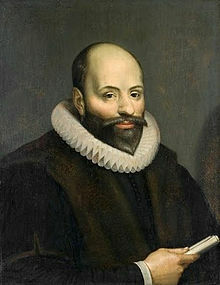 Arminius, Arminianism, and Europe: Jacobus Arminius (1559/60-1609). Boston: Brill Academic Publishers. ISBN 9789004178878. Olson, Roger E. (2006). Arminian Theology: Myths and Realities. Downers Grove, IL: IVP Academic. ISBN 0830828419. Picirilli, Robert E. (2002). Grace, Faith, Free Will: Contrasting Views of Salvation. Nashville: Randall House Publications. ISBN 0892656484.